This UniBond Aero 360 Moisture Absorber uses a natural process to absorb excess moisture from the air. The 2 in 1 Aero 360 tab is made from ultra-absorbent crystals for superior moisture absorption and patented anti-odour technology with no spills or noise and no electricity needed. Effective in combating bad smells and the development of dust mites and mould by absorbing excess moisture from the air, this is ideal for large rooms up to 20m². 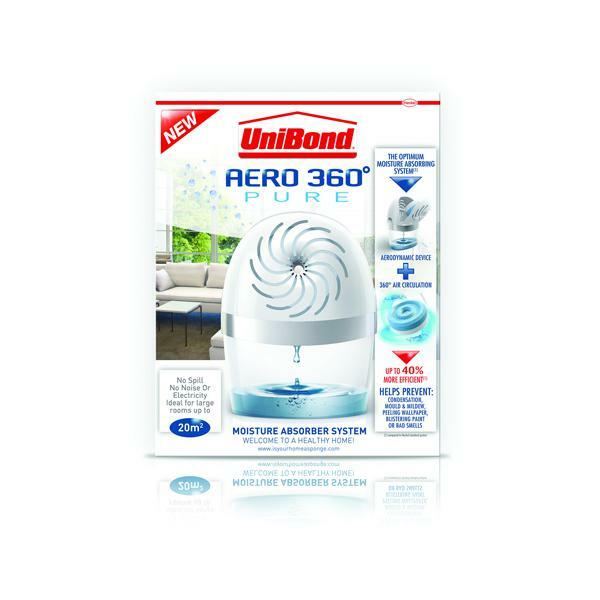 With this promotion, when you buy the UniBond Aero 360 Moisture Absorber you get a pack of 2 refills absolutely free!